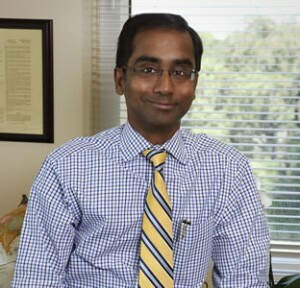 The American Association for the Advancement of Science (AAAS) recently named University of Texas San Antonio (UTSA) professor Bernard Arulanandam a 2014 Fellow, a distinction given by his peers in recognition of his work to advance the scientific field. Arulanandam holds the position of Jane and Roland Blumberg Professor in Biology and assistant vice president for research support, and will receive the recognition on Saturday, February 14 at the 2015 annual meeting of the American Association for the Advancement of Science in San Jose, California. Currently the largest scientific society and scientific journal publisher in the world, the AAAS includes 261 affiliated societies and academies, which serves about 10 million people. Arulanandam joins a series of other scientists who are distinguished as fellows, three of which are from UTSA. With a career that started at UTSA in 2001, Arulanandam has been dedicated to the study of bacterial infections and the body’s immune response to infectious diseases. He is focused on creating not only vaccines, but also therapies for preventing treating infections, and has researched mucosal surfaces — important entry points for pathogens and often the body’s first line of defense. [adrotate group=”15″]In addition, Arulanandam’s lab work focuses on the biothreat agent Franciscella tularensis, as well as on the bacterium responsible for conditions such as tularemia infection, or “rabbit fever.” He has also been dedicated to the development of a vaccine against chlamydia, as he and his colleague Guangming Zhong in 2009 established an exclusive license and sponsored research agreement with Merck and Co., which has become the first revenue-producing license for any technology developed at UTSA. The immunologist is also one of the scientific directors of the Vaccine Development Center of San Antonio, which works in collaboration with the UT Health Science Center, Southwest Research Institute and Texas Biomedical Research Institute. In addition, he directs the Center of Excellence in Infection Genomics, which is supported by the Department of Defense, and the South Texas Center for Emerging Infectious Diseases. With more than 100 research papers published, and having received funding from several different agencies such as the National Institutes of Health, the Department of Defense, and the Department of Homeland Security as assistant vice president for research support, Arulanandam has also been responsible for strategic development and implementation at UTSA.